When Hewlett-Packard's iPad challenger, the TouchPad, arrives on July 1, the tablet will have to struggle in a limited pool of apps, just like its Android counterparts. At the core of the iPad's success, the App Store is the steam powering developers' engines to make cool apps for those who shell out upward of $500 for a tablet--but HP does not have that for the TouchPad. Meet WebOS Pivot, HP's way to encourage developers to flock to its platform and make cool apps for the TouchPad too. 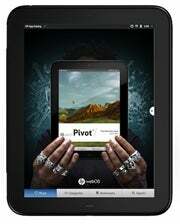 Pivot is basically a monthly magazine about the HP App Catalog. The publication is set to feature interesting and popular applications, as well as the developers behind the apps, in order to push sales through the app store for WebOS. By the sound of it, HP is putting a lot of effort into Pivot. The magazine will feature "original content by journalists and photographers affiliated with leading publications" published in four languages (English, French, German, and Spanish), and will be updated over the air automatically for all HP TouchPad buyers. It's unclear how exactly a monthly digital magazine delivered to app TouchPad users will boost sales for the tablet's app store. HP VP Richard Kerris says "Pivot brings app discovery to a new level for customers and developers alike," but a slightly better explanation comes from Conde Nast's Joe Simon (whom HP is collaborating with for Pivot), who says "[Pivot] provides an enriching experience for customers and is a great environment for developers considering the platform." Scheduled to ship July 1, the HP TouchPad is positioned to be the number one iPad competitor, with a more polished OS and functionality, in comparison to Android tablets. The TouchPad will also match the iPad pricing (Wi-Fi only, 16/3GB) at $499 and $599 respectively, but HP's tablet still have some shortcomings by comparison, including the lack of a back camera, 3G connectivity options, and of course, the lack of apps.